Made with select veneer and hardwood solids. 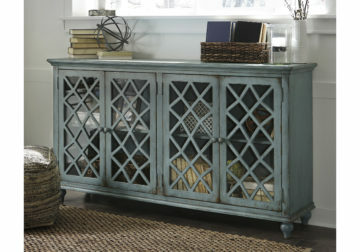 Each piece is finished in a gently distressed vintage painted finish. Each piece is moderately scaled and selected for its versatility of use in the home. Doors and drawers have simple bronze color metal decorative knobs. T505-560 has 4 wood panel doors with adjustable shelf behind in an antique white texture painted finish. T505-662 has 4 wood framed doors with tempered glass inserts and adjustable shelves behind in an antique gray texture painted finish. 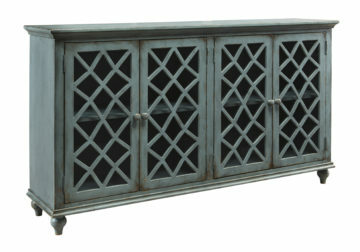 T505-642 has 2 wood framed doors with lattice effect and tempered glass inserts and adjustable shelves behind in an antique gray texture painted finish. T505-762 has 4 wood framed doors with lattice effect and tempered glass inserts and adjustable shelves behind in an antique teal texture painted finish. T505-742 has 2 wood framed doors with tempered glass inserts and adjustable shelves behind in an antique teal texture painted finish. T505-562 is finished in an antique white color and has mirror panels inset in door frames with ornate decorative filigree. T505-962 is finished in an antique chipped gray color and has fluted pilasters and ornate metallic finish grilles inset in door panels with clear glass.